Nursing homes are supposed to be safe environments where elderly Floridians can live in security and dignity, but too often that’s not the case. In fact, Florida’s Long-Term Care Ombudsman Program reported over 7,500 complaints concerning residents living in nursing homes, assisted living facilities, and adult family-care homes. Due to the breadth of the problem, federal and state laws create protections for nursing home residents, who are easily abused or neglected. Florida law sets standards for nursing homes, including residents’ rights with a goal of ensuring residents enjoy adequate care. Most importantly, it provides for claims against nursing homes when a resident’s rights are violated or when they are injured. 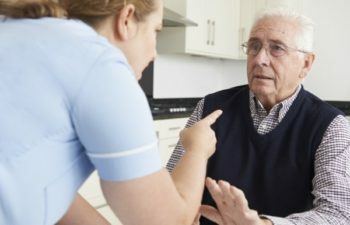 So to help ensure that your loved ones are being treated with dignity and care, here are some steps to follow if you suspect nursing home abuse. Be calm. When you first suspect or notice signs that your loved one is being mistreated the best thing to do is to keep your composure.If there is clear-cut abuse, or if you have reason to believe a nursing home resident is in imminent danger of harm, call the police immediately. At the very least, you should be asked to file a complaint. In some cases, police may need to intervene to ensure the safety of nursing home residents. Take Notes. Ask your loved one how they are being treated privately. Be aware that those in nursing home care may be reluctant to speak out about abuse for a number of reasons, ranging from fear to simply not wanting to worry you. Make sure to take notes on their story as well as document other things that lead you to believe abuse might be occurring. Many pieces of evidence, such as bruises, sores, or legions might be time sensitive, so you want to make sure they are documented. Speak to the Staff. Before jumping to conclusions, hear out the reasons behind your concerns. Ask your questions about what you have noticed. What you may have suspected as foul treatment might not have been. Nursing home management should be willing and able to explain any situation you see as possible abuse or neglect. If they are unable or unwilling to explain the situation satisfactorily, you will want to look into more formal action. Report it. Report all suspected elder abuse or neglect. Each state has some form of protective services for adults. If you are not sure who to contact in your state, call the National Center on Elder Abuse at 1-800-677-1116. In addition, each nursing home must publicly post the name and telephone number of the local Ombudsman. Consult a lawyer. If a nursing home resident or your loved one is being abused or neglected, he or she is entitled to protection. He may also be entitled to compensation under the law. Depending on your relationship to him or her, you may also be entitled to compensation as well. By contacting a nursing home neglect attorney at Ligori & Sanders, Attorneys at Law, you can find out what legal rights you have. There are many options available in taking legal action against the facility or caregiver responsible for the neglect or abuse. We offer a free consultation to help you get started. We happily represent clients throughout Hillsborough County and the surrounding areas from our offices in Tampa, Florida. Do You Have a Case? Free Consultation! I just wanted to take a quick time out to say something nice about Mr. Tim Sanders. This man spent an entire year handling my affairs like he was my personal friend. He went to bat for me, and I could tell he cared a great deal about me, my case directly, and he clearly takes a great deal of pride and integrity into his work. You hear a lot of negative about lawyers in this world. Tim, was a tireless worker to get me what I deserved. This guy does his living from the heart. I made a really great choice when I called Tim. My wife and I are so thankful we did. My experience with Ligori & Sanders was excellent. Their attention to detail and genuine concern for my situation showed that they truly cared about me as a client. The staff was professional, knowledgeable, and kept me informed throughout the entire process. I would highly recommend Ligori & Sanders to anyone needing help and direction after an auto accident. Ligori & Sanders is an amazing law firm. The employees take time with you to make sure that you truly understand the details of your case and why things are done a certain way to produce the best results. When calling, I always spoke to a person and on the off chance that a message was left, I received a return call promptly. I highly recommend Ligori & Sanders. Mr. Ligori's firm took the time to explain the legal process and find another attorney in another county. If this law firm can go the extra distance for not even their client, imagine the dedication and expertise if you were their client. I got into an auto accident and hired Mr. Sanders to represent me a couple weeks later after my insurance company’s lackluster performance to help get me back to normal. I was nervous, this was my first accident with injury and I had never hired a lawyer before. Well let me say, my expectations were met and exceeded, every step of the way. Ligori and Sanders were focused on me and my health. They were polite, prompt, and went to bat for me when the insurance company was not. Not only would I recommend Ligori and Sanders to anyone who needs them, I would insist. I had a pleasant experience dealing with Meylin. Mr Ligori will work hard to resolve any issues, he is the go to guy. Mr.Ligori and George helped me with my case, great lawyer, they helped me find what I needed for my case very informative. I’m glad they handled my case. Thank you! © 2019 Ligori & Sanders, Attorneys at Law. All Rights Reserved.